I love the shoes and all the blending that you did - great layout. This is absolutely gorgeous! I'm always in awe of people can who blend pages and photos so well! The dancer girl, the photo, the title, the word art. Perfect! I love the way that your background blends together. Great title work. Beautiful! Love the blended photo and fashion sketch. Great title. Gorgeous artsy page! 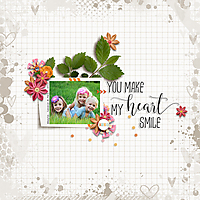 I love the blended photo and the stamps/brushes you used. My god daughter wants to take ballet, she just turned 4. 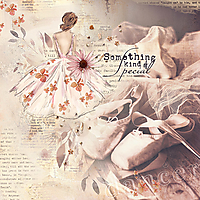 This is such a delicate layout that I can see hanging on a wall for someone who is a ballet dancer or just loves the ballet. Beautiful job.